In the week leading up the two-year anniversary of the SOPA blackout protests, EFF and others are talking about key principles that should guide copyright policy. Every day, we'll take on a different piece, exploring what’s at stake and what we need to do to make sure the law promotes creativity and innovation. We've put together a page where you can read and endorse the principles yourself. Let's send a message to DC, Hollywood, Silicon Valley, Brussels, and wherever else folks are making new copyright rules: We're from the Internet, and we're here to help. Today is Internet Freedom Day, the second anniversary of the Internet Blackout that derailed the SOPA/PIPA train. It’s also the culmination of Copyright Week, a week devoted to thinking out loud about how to get copyright right. At EFF, we’ve been tremendously impressed by the criticism and commentary we’ve seen this week about copyrights, copywrongs, the user rights that are still under threat, and how we can best protect them. It’s collected here. The upshot: The Internet Blackout helped win a crucial battle. Now it’s time to start winning the war. Fortunately, history, technology, and common sense are on our side. Step one is to make clear that we are not standing down. In the wake of the Internet Blackout, copyright maximalists did their level best to characterize the millions of Internet users who took part as misled and misinformed, more concerned about free stuff than a free Internet, perfectly happy to do whatever Google tells them to do. We know what really happened. We know that the Blackout expressed the unwavering opposition of a broad coalition of public interest groups, technologists, academics, technology companies (big and small), archivists, authors, artists, musicians, bloggers, and just plain concerned citizens, all of whom correctly saw a grave danger to the future of the Internet. Together, we reminded the U.S. Congress who it works for. We sent an unmistakable message that laws affecting all of us can't be made in a backroom by insiders bearing campaign cash, whether those insiders represent Hollywood or Silicon Valley. We not only took back the democratic process, we dragged it into the 21st century. And we’re not going away. Step two is to be very clear about what we’re fighting for. For most of us, the goal is not to eliminate copyright altogether or make enforcement impossible, or whatever other cliché the maximalists want to pin on us. The goal is to reintroduce a sense of balance, fairness and rationality, so that copyright can once again serve its purpose under the U.S. Constitution: to promote creativity and innovation. Insane copyright terms; excessive and unpredictable penalties; laws that punish people for hacking the DRM on their devices in order to repair them, make them work better and fix security flaws—or even talk about it in public; lawsuits that try to stifle new and useful products that enable fair uses; government seizures of blogs that mistakenly include a few infringing links; proposals to force intermediaries to police (and therefore monitor) user-generated content—none of these things serve copyright’s purpose. Here’s what does: sane limits and thoughtful enforcement policies, developed through a transparent and democratic process, based on real evidence of costs and benefits. Policies that take it as a given that a free and open Internet is essential to copyright’s purpose and must not be sacrificed at the altar of copyright enforcement. If that strikes you as radical, with all due respect maybe you are the one who is misled and misinformed. Let's talk. For the rest of us, consider this a call to arms: it’s time to take back copyright. Want to know what you can do right now? 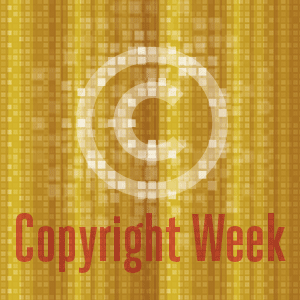 Visit the Copyright Week website for a collection of actions you can take on a variety of issues, and information about why you should. Endorse the Copyright Principles. And stay tuned: we’re just getting started.